La Maison is a beautiful newly built villa only a few steps away from the black beach of Monolithos. 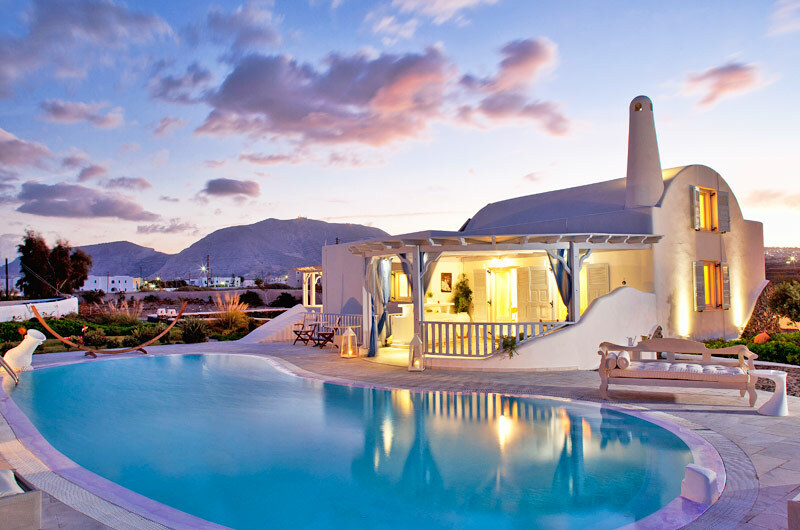 The Villa combines the traditional style of Santorini with the comforts of the high expectations of its guests. La Maison is a perfect luxury villa for providing a relaxed and at the same time enjoyable stay. La Maison Villas decoration will astonish you tahnks to the combination of the typical island style design and the human aspect. It is a place with unique aesthetics and great space functionality. La Maison is eprfect for those who seek absolute privacy. It is an elegant villa which is composed by 3 bedrooms (2 rooms with matrimonial beds and 1 room with 2 single beds), 1 Bathroom with an indoor Jacuzzi and a different area with a shower, 1 WC, fully equipped Kitchen, a spacious living room with fireplace, 1 outdoor swimming pool, outdoor Jacuzzi, Pool Bar, Private Church, B.B.Q., a beautiful Garden with grass, olive trees, colorful flowers, and plants is an ideal place for children to enjoy a safe play in our children playground. You will be able to enjoy the Guest Facilities such as the Welcome basket (Bottle of Wine, Mineral Water, Fruits, Flowers), the romantic Fireplace, the DVD palyer or the Tvs and many more, such as Wireless Broadband Internet, Full equipment for Kitchen & Bathroom, Bathrobes & slippers with Bath amenities, First aid kit, Children's playground and many more! There also other services on request for your convenience, such as PC/Laptop/Microsoft X-Box rental, Car/Boat rental arrangments, Diving, Water sports, Horse riding, Helicopter and Private jet hire, Beauty Services (massages, manicures, pedicures, hairstyling), Chef & Catering service upon request and many more. You can arrange your wedding or ceremonie to take place at this beautiful villa. Enjoy your celebrations in a sophisticated and luxurious setting. La Maison offers special wedding incentives for your special wedding event at our private church, giving you a taste of a traditional Cycladic-style wedding on Santorini island for the most memorable day of your life. Children up to 4 years of age are free of charge.